Water Well Solutions has municipal, irrigation, industrial, extraction and dewatering, and exploratory water well drilling in Illinois services available. Water Well Solutions would like to go over these water well drilling in Illinois services in detail so you better understand what they are. Our municipal water well drilling in Illinois services are available for your town or city. Water Well Solutions specializes in setting up new housing developments. If for any reason you have any questions or comments about our water well drilling in Illinois services, feel free to give us a call at 888-769-9009 or use the form on the right. Water Well Solutions has over 16 years of experience and are experts at water well drilling in Illinois industrial services. Our company will find good, clean, high quality water and will develop an industrial water well that will provide high quality for years to come. Our water well drilling in Illinois services will handle the drilling project from start to finish including the water well design, getting all the required permits, developing the well, well water testing, and contacting utility line locators to make the process go as smooth as possible. The exploratory water well drilling services Water Well Solutions has available can absolutely be beneficial for your town or city if you are looking for new clean water resources. Water wells drilling in Illinois is a great way to find new water supplies for new housing developments or for your business. 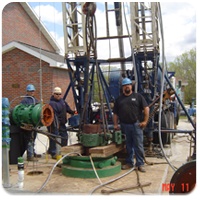 Water Well Solutions is your number one choice for water well drilling in Illinois. If for any reason you have any questions or comments about our permanent well construction and drilling in Illinois services, feel free to give us a call at 888-769-9009 or use the form to the right.